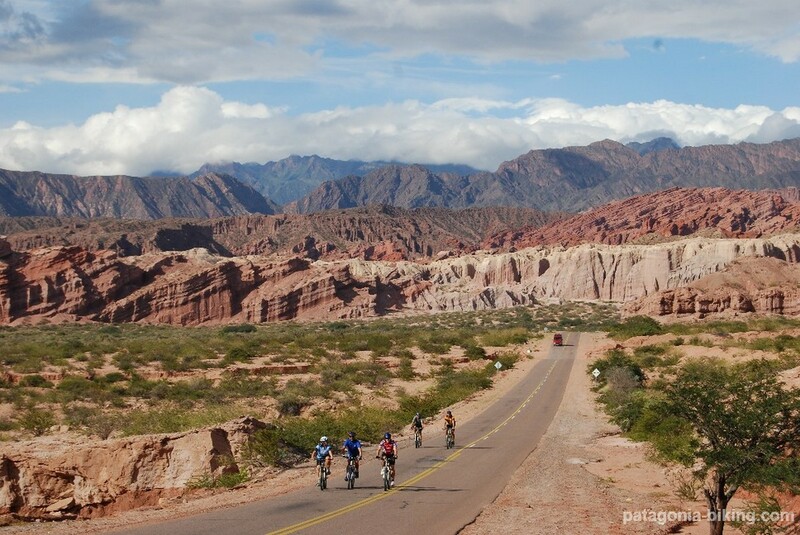 We will ride the Quebrada de Humahuaca, in Jujuy (UNESCO’s World Heritage site), with its colorful mountains and Pre-Columbian ruins. 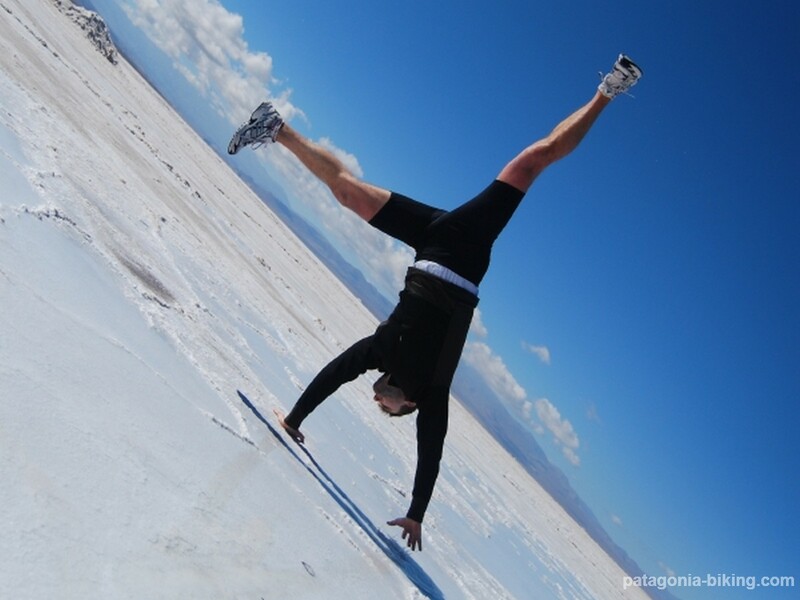 We will go up the altiplano to visit the “Salinas Grandes”, an immense dry lake of salt. The inhabitants there work hard extracting salt from the lake. We will then go through some tropical vegetation (yungas forest), go up the famous Cuesta del Obispo. Suddenly we will find ourselves in a completely different scenery: cacti and colonial style villages with interesting architecture; craftsmen and farmers. Valles Calchaquies. Through dirt roads –with some sand stretches- we will go into narrow valleys with lunar landscapes that contrast with the farmed fields. We will be able to see the suggestive “Quebrada de las Flechas”. We will visit Calafate, with its famous vineyards, its pleasant weather and large square. The vast and green valley of Tafi del Valle, with its lake at the centre, from which we will start the long descent by the blindingly green Reserva Natural de los Sosa. We will finish the trip in the lively Tucuman, partying with the famous empanadas tucumanas and a good glass of wine. Meeting in Jujuy and transfer by minibus -130 km- to Humahuaca, 2900mosl. Walk through town in order to acclimatize. We will ride on secondary roads through the surrounding area with its small traditional villages. Distance: 40 km of gravel road. 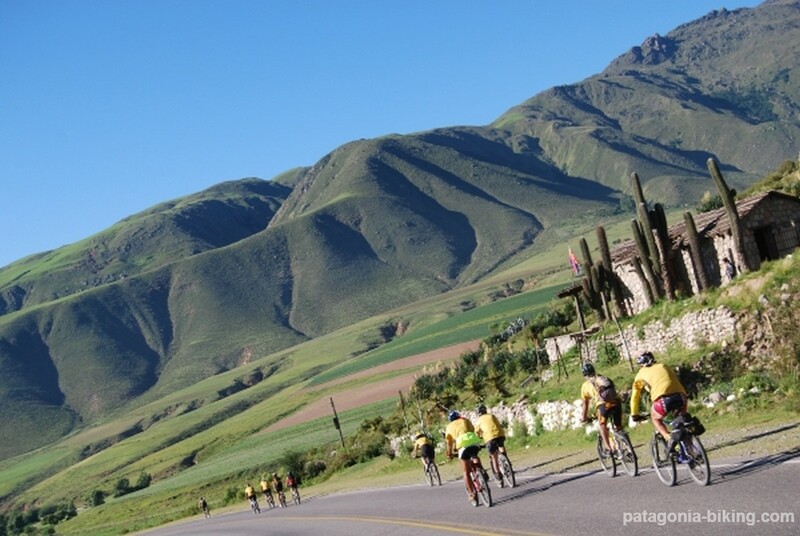 We ride through Tilcara (2460mosl) and we visit Pucara, an old fortress with an spectacular lookout point. 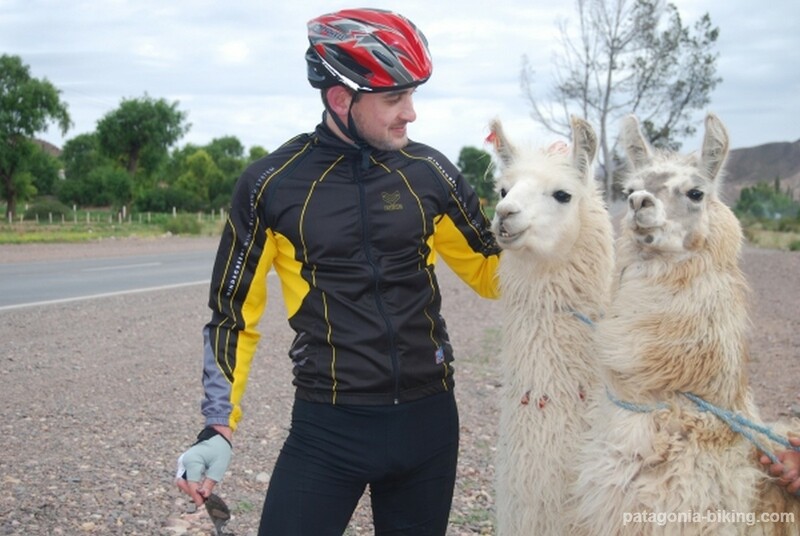 We will also ride across Maimara and the “Cerro de los 7 Colores”. Distance: 65 km with a positive level difference of 700 m.
Lodging: cabins (in a privileged location). We will ride across Tumbaya and visit the local arts and crafts market and museum. After Volcan, we will make a fast and long descent of 10 km. In the afternoon, we would have the chance of going to a hidden waterfall in the yungas forest. 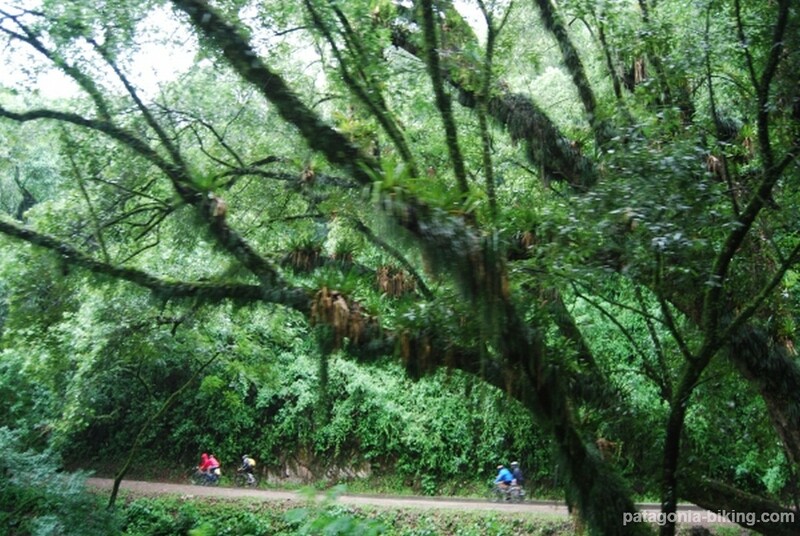 We will ride on an old ledge road, surrounded by lush vegetation and go through the Abra de Santa Laura and La Caldera. 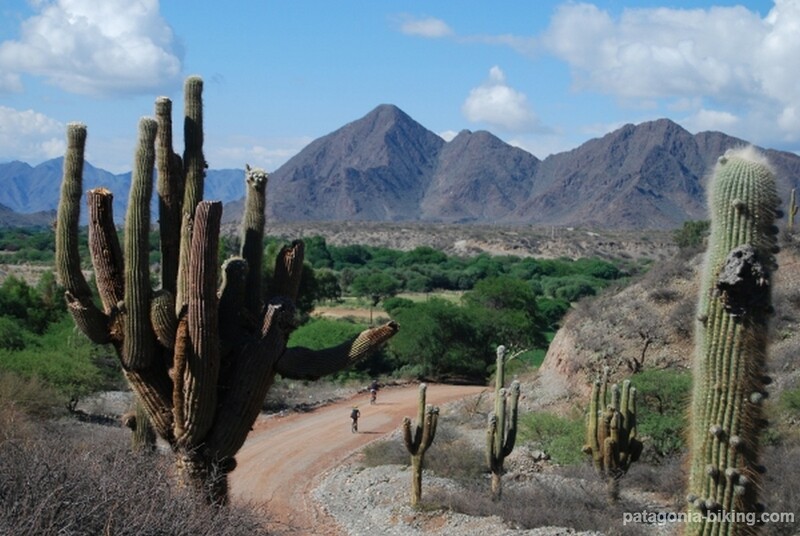 We will make a transfer of about 100 km to the start of the Cuesta del Obispo, going through the peculiar “Quebrada del Escoipe”. Those who wish to, will be able to make the 20 km ascent to “Piedra del Molino” (3340mosl). As a reward, you will have a spectacular descent and the crossing of the “Recta de Tintin”, in Los Cardones National Park. 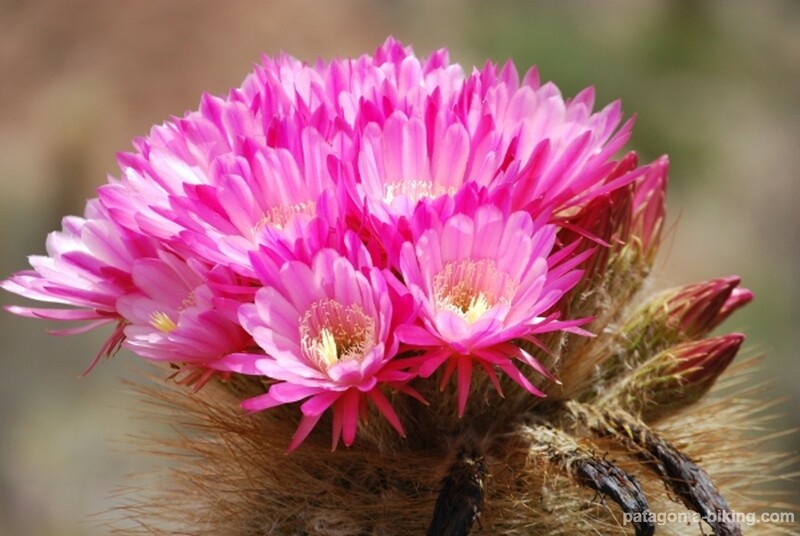 The aboriginal word “cachi” means “pleasant”, which is exactly what the colonial style town and oasis are. 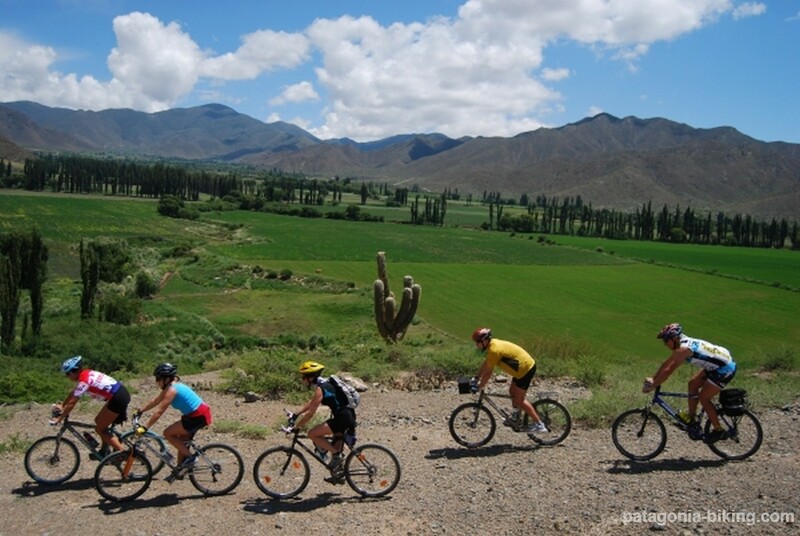 We will ride 15 km to visit the peculiar town of Cachi Adentro, a farming and arts and crafts town. We will ride through a road called “artisan’s way”. We will have the chance to look at the artisan’s work and we will arrive at the interesting town of Seclantas. We will have the chance to make a detour to the Brealito lagoon. We will end the stage at Molinos, founded in the XVII century where we can find a church declared “National Heritage”. 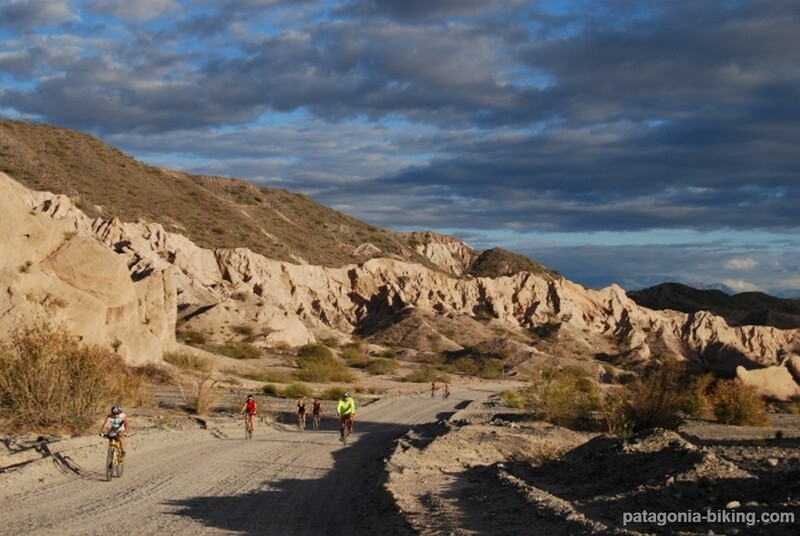 We will divert about 2 km from the Ruta Nacional 40 in order to enter the colorful and contrasting Angastaco Valley and spend the night in an 800 inhabitants village. 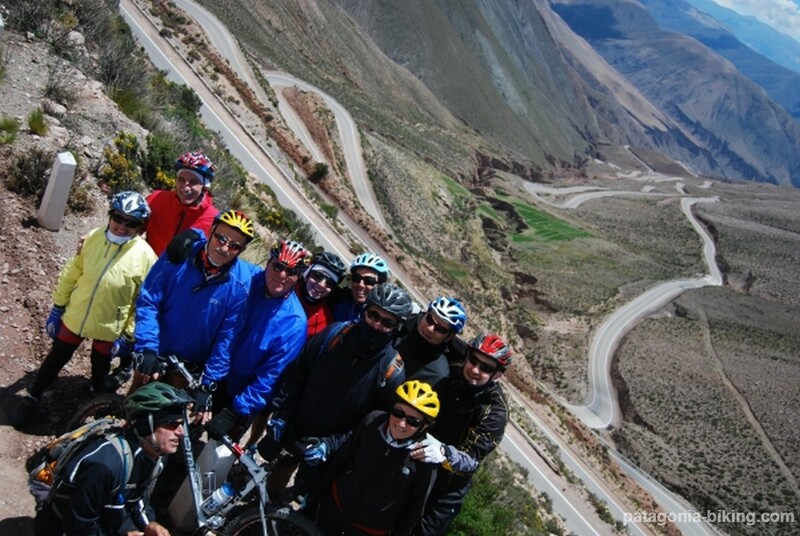 We will ride through the interesting “Quebrada de las Flechas” and the town of San Carlos. This is the biggest town in the Valles Calchaquies, its importance due to the production of well-known wines. 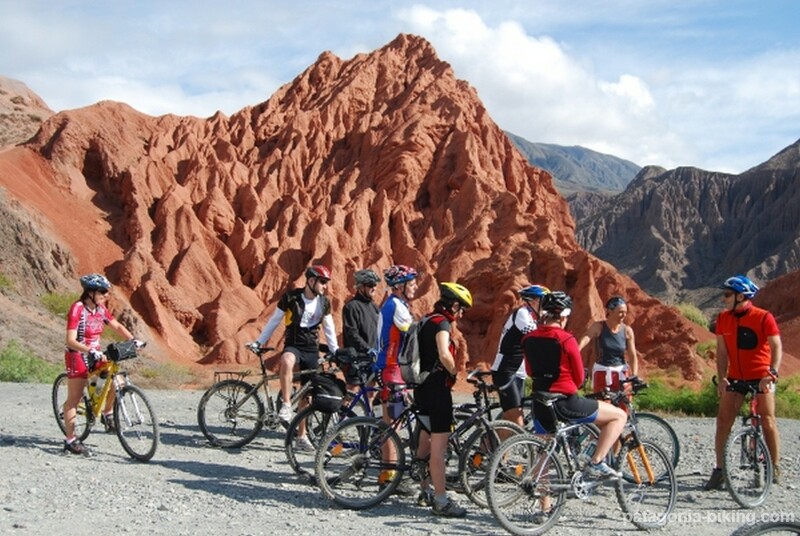 We will visit two wineries and make a trip to the “Quebrada de Calafate”. Lodging: hostel. Dinner not included. Transfer to Amaicha del Valle (70 km). Visit to the “Pachamama” museum. Chance to make the 35 km ascent to Abra del Infiernillo (3100mosl). From there it’s a 20 km descent to the green valley of Tafi del Valle. Distance: 127 km, the last 60 km on the bike. Lodging: cabins with spectacular valley views. After the Angostura dam, we start a spectacular descent inside the Reserva Natural Los Sosa and surrounded by the green yungas forest. 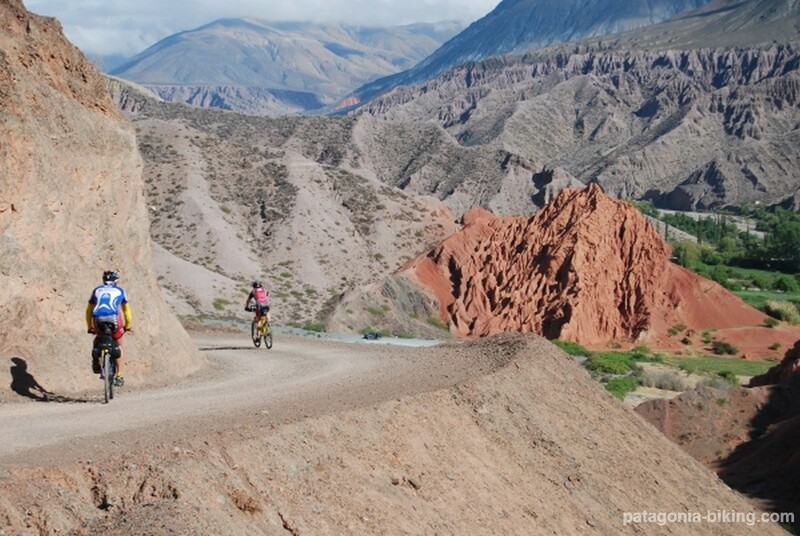 The descent is about 45 km (with a positive level difference of 1400 m), down the Quebrada del Rio de los Sosa to Acheral (550mosl). Distance: 120 km. The first 60 km (steep descent) we will ride on our bikes and the following 60 on the support vehicle. Jujuy, Quebrada de Humahuaca, Tilcara, Purmamarca, Salinas Grandes, Abra de Potrerillos (4200mosl), Tumbaya, Yala, Salta, Cuesta del Obispo (3350mosl), Parque Nacional los Cardones, Cachi, Seclantas, Molinos, Angastaco, “Quebrada de las Flechas”, San Carlos, Cafayate, Amaicha del Valle, Paso del Infiernillo (3100mosl), Tafi del Valle, Quebrada de los Sosa, Tucumán. 690 km (215 gravel and 475 asphalt) divided in 12 stages. Average distance: 57.5 km p/day. 400 km in minibus transfers. m), with a level difference of 2000m over a distance of aprox. 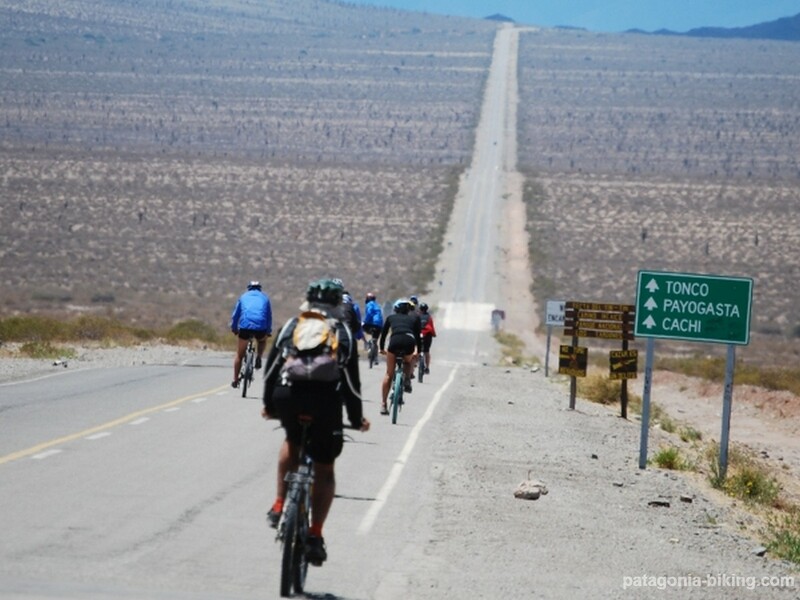 45 km, La Cuesta del Obispo (3350mosl) to Cachi (2280) and the Abra del Infiernillo (3100) to Tafi del Valle (2000mosl). We will get to the passes in the support vehicles, but those who want to ride their bicycles will have the possibility to do it. It is 215 km on gravel road and 475 km on pavement. generally dry. Minimum 10 C (at night on higher ground) and maximum 35 C. There could also be some summer showers in the lower altitudes. In order to be properly organized and get better flights the registration should be confirmed 4 months in advance.